When you first open the Music app on a new Windows 8 tablet, you won’t find much but an empty shelf. After all, you haven’t had time to copy any music onto it yet. Even an empty tablet, though, can dish out just about any song you want to hear. Those songs come from an Xbox Music Pass, a service Microsoft entices you with when you open the Music app. If you’re curious as to Microsoft’s way of letting you listen to more than 30 million songs for free, follow these steps to sample the Xbox Music Pass. Load the Music app with a tap of its tile on the Start screen. My Music: Hidden off to the left, the Music app shows songs or albums you’ve copied to your tablet’s Music library. Now Playing: Shown when you first open the program, this area lists your currently playing song. Tap any of the surrounding buttons to begin hearing free music. All Music: Shown to the right of the Now Playing section, this area lists popular artists and albums, all ready to play with a tap. Top Music: Scroll to the far right to hear something quickly: a list of the latest chart- toppers, ready to play with a tap of a finger. In the Now Playing section, tap the Play an Artist tile, type in your favorite artist’s name, and tap the Play button. Before the music begins to play, however, you’re interrupted by Step 3. Tap the Sign in Now button to sign up with Xbox, and then tap the I Accept button. Tap OK to approve the process and listen to music by your chosen artist. Your new Xbox profile gives you a nonsensical “gamer tag,” which is simply an Xbox nickname. You can safely forget it, as Xbox Music begins greeting you by that name whenever you log on. 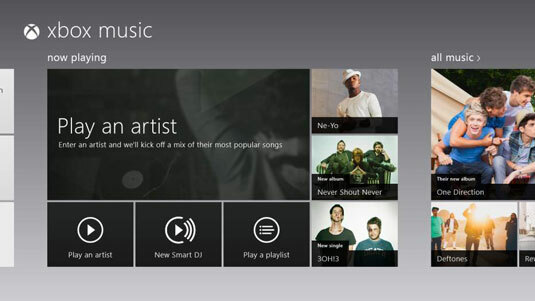 After you’ve dispensed with the red tape, the Music app slips into its Xbox Music clothes and begins playing songs by the artist you chose in Step 2. You’re now free to listen to millions of songs by thousands of artists, simply by tapping the Play an Artist button and typing in the artist’s name. Or, tap an artist or album listed in the All Music or Top Music sections listed in Step 1. It’s just waiting to be played. You need an Internet connection to hear the music because that’s how Microsoft sends the tunes to your tablet. When you’re out of range of a Wi-Fi connection, the music stops streaming. Microsoft occasionally slips ads in between songs. Sometimes you just hear a voice-over; at other times, the Music app plays a full-screen video ad. And after six months, Microsoft limits your ad-supported-but-free streaming to ten hours a month, which is about 20 minutes a day. To bypass the ads and the ten-hour monthly limit, sign up for a free 30-day trial. After 30 days, Microsoft begins automatically charging $10 a month to your credit card. During that 30-day trial (and if you subscribe to the service), you can play, stream, or download any of the music on your tablet, a Windows Phone, a Windows 8 PC, or an Xbox 360 console (provided you’re an Xbox Live Gold member). Those platforms all run Xbox Live, and you can only play the songs through Xbox Live by signing into the service. If your subscription lapses, you can no longer play your music, including music you’ve downloaded – unless you’ve bought the music, that is, which costs extra. After they’re purchased, however, those individual songs are yours to copy to CD or play on other PCs and music players. Xbox Music Pass isn’t cheap, and it’s filled with fine print. But if you pony up $10 a month for the service, it’s very convenient – until you stop paying, that is. Then your music disappears, and you’re back to ten hours a month of ad-supported music.